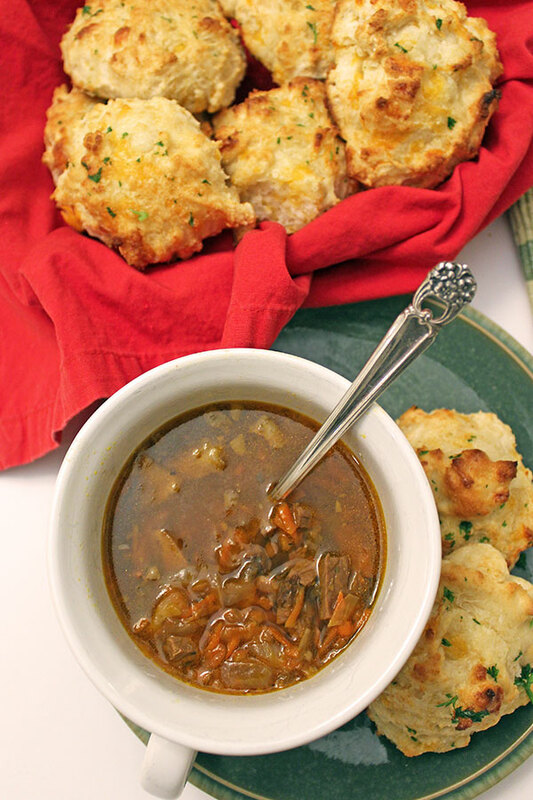 Vegetable beef soup is kind of a classic that when paired with hot crusty bread, and freshly baked bisquits, makes an excellent cold weather meal. This particular recipe is one that I remember having as a kid and is a great way to use the leftover meat from a Sunday roast. You can also adapt this version using stew beef and would just need to add in a step to prep the stew beef. I like to use leftovers however and is a great way to create a lighter alternative using lots of veg. In this recipe, I have grated the carrots and chopped vegetables really finely. If grating is not your thing – you can also just chop and add into the soup and it is just as tasty. You can adjust the added veg based on your preference. Root vegetables grated create a slightly sweet overtone. Depending on what you had originally seasoned your roast with may impact some of the flavours that are captured in the soup. You may want to tweek the seasonings as the soups cooks and adjust accordingly. Add onions and olive oil to a large saucepan and cook on medium heat until slightly transparent. Add grated carrots, celery and blend well. Season with Worcestershire sauce, salt, and pepper. Finely chop the beef into small pieces removing any unwanted fat. Add beef, beef broth, water, tomato paste, garlic and bay leaves. Continue to simmer on medium to low heat for about an hour.